Emotional Support Animal Letters » Blog » Turmeric for Dogs: Safe Alternative to Pain Medication? Turmeric for Dogs: Safe Alternative to Pain Medication? Summary Version: Turmeric is GREAT for dogs (particularly those with joint pain). The Brand we recommend is Vets Preferred. Turmeric is a spice that is part of the ginger family. For thousands of years, it was used as an anti-inflammatory agent to treat various conditions. In East India and the Middle East, turmeric was often used to treat hemorrhaging, toothaches, menstrual problems, bruises, and chest pain. But what about turmeric for dogs? Recent studies on turmeric have shown that the spice can offer benefits to animals and people who suffer from cancer, reoccurring cysts, and inflammation in the muscles or joints. While many people may already be aware of how useful this essential spice is for humans, pet owners are now learning that turmeric can be a wonderful supplement for dogs. It is especially helpful for older canines that suffer from arthritis pain. Several studies have shown the effects of turmeric on dogs and how it can help with issues such as arthritis and cancer. Can Dogs Eat Turmeric? Is Turmeric Safe for Dogs? A CBD Treat with Turmeric for Dogs! Turmeric Dosage for Dogs: How Much Turmeric can you Give a Dog? What is Turmeric Curcumin? Is it Safe too? Can I Give My Dog Turmeric Capsules? Yes, it is perfectly safe for dogs to eat turmeric whether you mix it in their food or give it to them baked in a treat. You can also make a golden paste which can make it easier to administer the spice to your pet. Since turmeric doesn’t absorb well on its own in the body, you should mix it with a healthy fat or black pepper. You can add these ingredients to a paste, give it to your pet directly, or add it to their food. Yes, it is perfectly safe for dogs to eat turmeric whether you mix it in their food or give it to them baked in a homemade treat. You can also create a golden paste which can make it easier to administer the spice to your pet. Every dog is different, and your pet may be a picky eater or refuse to eat anything that has turmeric added to it. The supplement is available in capsule form, however, be sure to read the label if you choose to purchase a commercial product. Turmeric capsules are designed for humans and some may contain more curcumin than your dog should take. It is a good idea to start out slow when you first offer turmeric to your pet. If your dog has a sensitive stomach, it could become more irritated if they ingest too much. It’s best to give your dog 1/5th of the recommended dosage, based on their weight, and increase the dose gradually after that until you reach their maximum dosage. Inflammation can occur with many different diseases and disorders. It’s not limited to arthritis pain. Health problems that many dogs face such as digestive issues, kidney disease, cancer, and allergies are all caused by chronic inflammation. Turmeric is an anti-inflammatory supplement shown to be more effective than ibuprofen when taken for arthritis pain. A study held in 2004 showed that it was even more effective than some of the best anti-inflammatory prescription drugs given to both humans and dogs with arthritis. For dogs suffering from cancer, turmeric is a revolutionary alternative to costly drugs. The American Cancer Society recently revealed that the active ingredient curcumin prevents the development of cancerous growth and stops it from spreading. It can also reduce tumors and can kill cancer cells. Is your favorite companion experiencing joint pain? The HonestPaws brand is one we can’t praise high enough as a pain solution. First recommended to us be a veterinarian we work with, the entire staff now swears by it. Read our more in-depth article here -> CBD Dog Treats. These treats combine the healing benefits of both CBD and Turmeric for dogs. With Honest Paws Pain Relief CBD Dog Treats, you can help ease that pain and give them comfort without the excess pills and whatnot. We know this treat can’t cure cancer or diseases, and we are not encouraging you to stop all the medicine prescribed to your dog (that’s up to your vet), but it can help them feel better and lead to an easier life… like all doggies should. The proper amount of turmeric for dogs depends on their weight. Obviously, a small breed dog such as a chihuahua will take less of the supplement than a larger breed, like a Rottweiler. Remember to start out slowly and work your way up to the maximum dosage for your pet. This will help you to identify any issues your dog may have by taking turmeric. However, these side effects do not show up often when humans or dogs take turmeric as directed. These unwanted effects are usually a result of taking too much of the supplement over time. It is possible to over supplement your dog. So, if you are already giving your pet several dietary supplements, take the time to learn more about them. You will want to find out if any of the supplements your dog takes will conflict with turmeric before administering it to them. Turmeric is available in powder, capsule, or pill form. If you choose to give your dog the supplement in capsule form, you should make sure that it has the right amount of curcumin. There are many commercial turmeric supplements on the market that contain very high levels of curcumin, as much as 95%. It is not recommended that you give your dog or any other animal this much curcumin in a single dose. If you are unsure about giving your pet commercial turmeric capsules, you can choose to add the powder to their food or create a Golden Paste, which is turmeric paste for dogs. Golden Paste is not difficult to make. And it can be easier to feed some dogs, especially those who love to lick the spoon. Add turmeric powder and water to a pan and gently stir while cooking over low heat. Stir until you have formed a paste, usually around 7 to 10 minutes. Add more water if needed. Add in ground pepper and coconut or olive oil. Stir slightly and allow to cool before serving. Store Golden paste in your refrigerator for up to 2 weeks. Giving your dog small doses of this paste each day will greatly impact their overall health. Scroll to the bottom of the article to find a nice infographic prepared by simplewag.com about how to prepare a golden paste for your dog. So you’re sold on turmeric for dogs, but trying to figure out how to get it in their system. If your dog doesn’t seem to like the taste of turmeric paste or powder, you can add the supplement to homemade dog treats as you bake them. Be sure to go by the dosage amount so that you don’t end up adding more turmeric to the treats than needed. Here is a basic recipe for homemade dog treats that includes turmeric. Preheat your oven to 350 degrees. Line a baking sheet with parchment paper. Dissolve the bouillon in water and set aside. Combine flour, brown sugar, flax seed, and turmeric powder in a bowl. Use a dough hook to add in the water and bouillon mixture, then add the peanut butter and egg. Mix until ingredients create a dough ball. Roll out the dough to 1/2 “thick. Cut into dog biscuit shapes and place the treats on the parchment paper. Bake for 35 minutes or until treats are dry and hardened. This recipe makes about 2 weeks’ worth of dog treats. Turmeric is a great alternative to costly and potentially harmful pain medication for dogs. 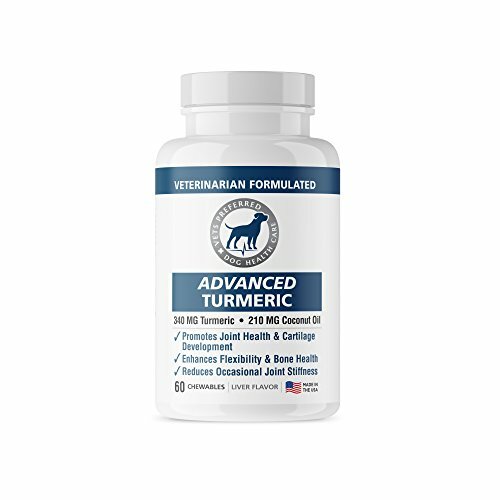 If your pet has arthritis or another ailment that turmeric could help with, it is worth giving the supplement a try. Always start out with small doses, even if you have a large dog and feel confident that they will not have any adverse effects. Even though turmeric is safe and most humans who take it do not experience side effects often, you want to make sure you don’t over-supplement your dog. It’s best to stay away from commercial turmeric capsules since many of them have a higher amount of curcumin in them than what is recommended for animals. Turmeric powder is a good option for dogs because you can measure out exactly how much your pet needs. Create a paste for your dog, or add the powder to their food one to three times per day for best results. When your pet is not feeling well, you want to do whatever you can to help them recover quickly. Sometimes, dietary supplements can work wonders for our pets where other treatment options fail. Consider adding turmeric to your dog’s daily regimen today and find out if it will help them get back to their old, active self once again. Has anyone given this to their dog as a home treatment for cancer? After all you did not specify if the maximum dosage is per meal or total per day. The way I read it I can give my 100lbs dog 2tsp every meal or I can give it 2tsp divided on all meals during the day. I find it extremely stupid and/or irresponsible to make such a mistakes when it comes to dosage. You open door for misinterpretations and thus harm. The article has the dosages by weight and states that you can give this dosage one to three times daily. It also states to start slowly and only give 1/5 of the dose and build slowly. I think that’s pretty clear if you had bothered to read it. I asked a question yesterday regarding the dose and use of your turmeric doggy treats in my 20kg Springer spaniel, using this address but it has not been published, so I have no response – why is that? Hey Sandra – it differs on how much turmeric you can give based on the weight of your dog. Please take a look at our dosage recommendations to determine how much turmeric for your dog is appropriate. Many reputable websites which specialize in pets, State that you should find a source from raw turmeric material containing at least 95% curcuminoids. Careful dosing as per body weight with a gradual work up when using a new supplement is important.